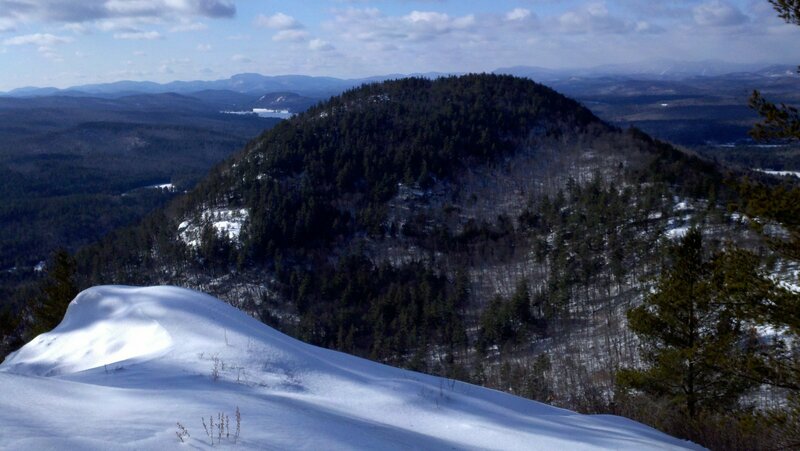 This mountain ridge is located just NE of Brant Lake in the Adirondacks of New York. First Brother and Second Brother Mountains are in the town of Horicon, while Third Brother Mountain is in the town of Hague. To access this area, take I-87 to Exit 25, then head east past Brant Lake to a left on Palisades Road. Travel north on Palisades Road 3/4 mile to State Land signs on the right hand side of the road. There is no designated parking area. I parked off the shoulder of the road. 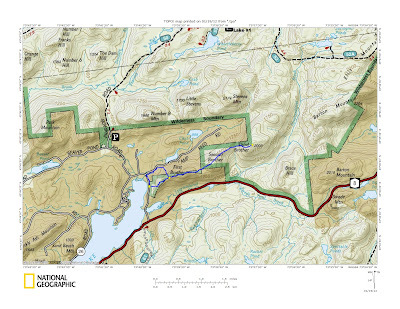 Looking at my National Geographic Trails Illustrated Map 743 - Adirondack Park - Lake George, I was convinced this ridge would be a nice hike, possibly with views of Brant Lake to the south. As indicated on the map, there is a little sliver of state land that runs along the ridge of First Brother Mountain. As you get into the col between First Brother and Second Brother, state land becomes more prevalent. I parked on Palisades Road intending to bushwhack west to east across the 3 brothers, then back along the same course. The temperature was in the upper 20's F, but the wind was strong and there was a weather advisory for winds 20-30 mph with gusts to 50 mph. With this hike being below treeline, my exposure to direct wind would be limited. The elevation where I parked was 900'. Within minutes of beginning my climb, I saw yellow blazes on trees indicating the state land boundary. 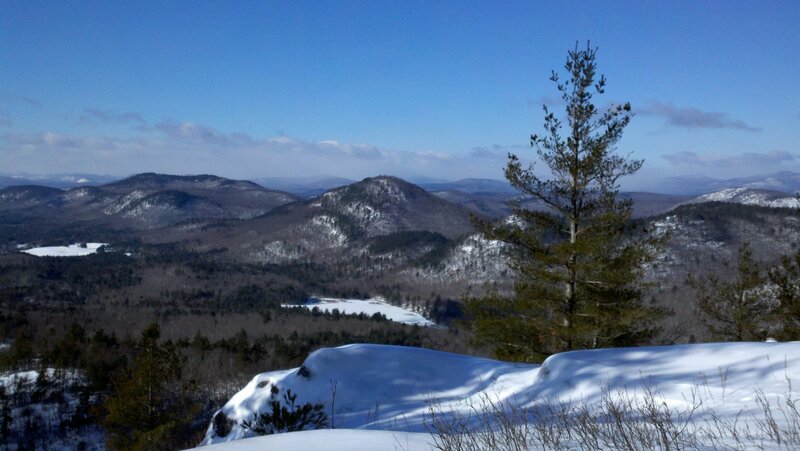 Shortly thereafter is the western shoulder of first Brother where you get a fantastic view SW back to Brant Lake. After an hour, I was on the summit of First Brother (elev. 1667'). Shortly before the summit I began to see a red blaze trail and I followed it since it was going right up the ridge the direction I was going. 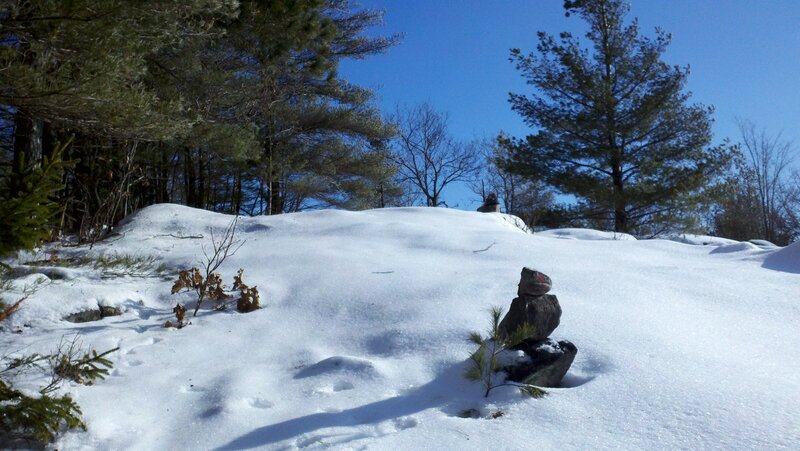 There are numerous viewpoints along the approach to First Brother. The summit is open hardwoods. I continued towards second brother. In the col, and as shown on the map, there is a pinpoint where there is no state land. At that point, there was a no trespassing sign posted by the Boys Scouts of Camp Curtis Reed. 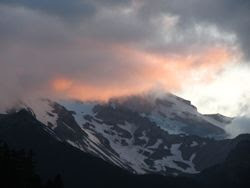 The yellow blazes continued though, as did the red blaze trail. I followed the red blaze trail the rest of the day and didn't see another sign. I also didn't see any other hikers the entire day. What I did see was a group of wild turkeys, and numerous grouse. I reached the summit of Second Brother Mountain which was marked on a rock outcropping with a pipe and a red blaze. 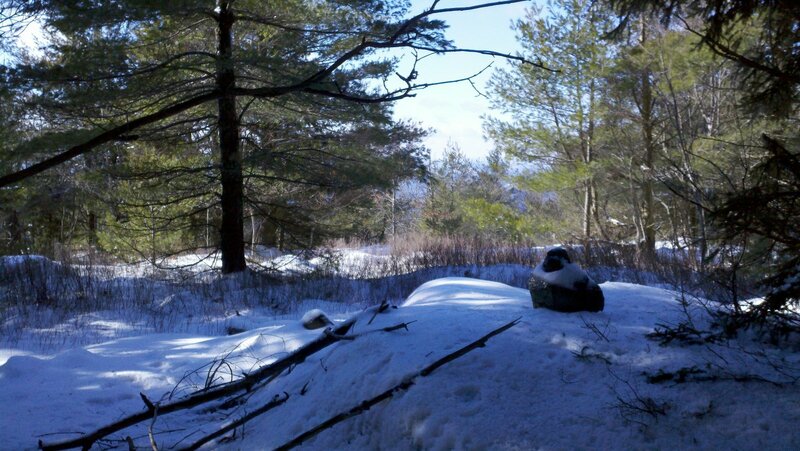 This summit was soft woods and there were fewer viewpoints. I continued eastward onto a nice open shoulder of Second Brother. From here there were good views of Third Brother and also Stevens Mountain to the NE. As I dropped into the next col, the trees switched back to hardwoods. The steepest part of the hike was next, which was the ascent of Third Brother. For this, I put on my micro spikes. There was about 4" of crusty snow on the ground, but there were also a few icy spots and the micro spikes would help and even more so on the return. 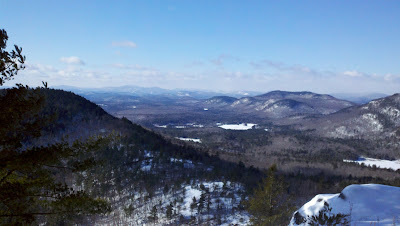 The best view on this entire ridge is just before you reach the summit of Third Brother. There are open ledges with great views back to Second Brother and from west to south, including a portion of Brant Lake. Gore Mountain Ski Area could be seen in the distance. 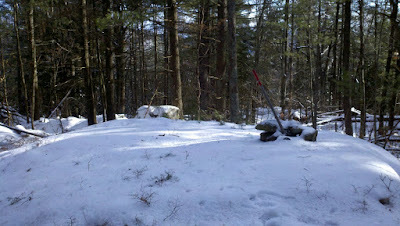 The actual summit was wooded and was marked by a small rock cairn with a red blaze on it. 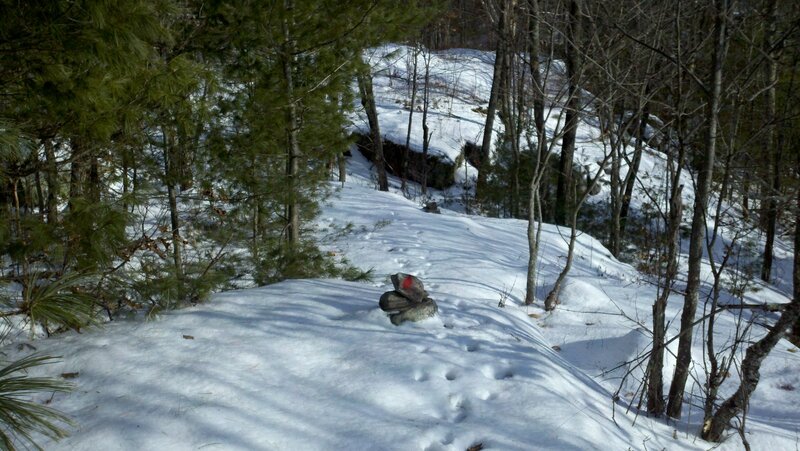 The red blaze trail appeared to end on the top of Third Brother. I contemplated the thought of continuing by heading north to Stevens Mountain, but it was noon and the winds were getting stronger. I could barely have my hands out of my gloves for more than a minute to take a few pictures I decide to leave Stevens Mountain and the ridge with Little Stevens Mountain and Number 8 Mountain for another trip. I returned via my ascent path until I was up and over First Brother and onto the last descent. At that point, the red blaze trail turned north and I followed it to see where it came out. It came out right in front of Camp Waubeeka (the Boy Scout Camp), on Camp Reed Road. This road is a private road, so I wouldn't have been able to drive to the red blaze trailhead. I walked back to the car on the road from that point. 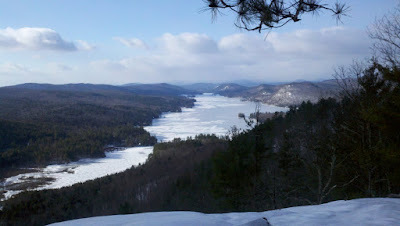 I recommend this hike for great views of Brant Lake (especially from the west shoulder of First Brother and the ledge on Third Brother) and for the variety of hardwoods and softwoods with rolling ridge terrain. It's not extremely difficult, but there was 2700 vertical feet from all the ups and downs. The view there looks wonderful. How I would love to go to New York and climb those three mountains. Their names sound interesting too.